With the recent launch of Google Street View for Spain and Italy the locals have been debating whether or not they think it’s a great mapping tool, or an evil invasion of privacy. This first guy loves Street View, and wants to give the passing car a great big hug. Awww. In Italy there’s a whole family of Street View fans, all happily waving for the camera. These guys can’t quite decide what to make of the Street View car, so much so they haven’t noticed the reversing car about to run them over. However, this moped driver who is following the car is certainly not impressed. Finally, these 7000 Spanish fisherman hate Street View so much they’ve organised a mass protest1! On the whole, it seems that the public are happy to welcome Google into their cities, but only time will tell how well the service is received as the inevitable privacy concern stories come to light. What are the chances of catching Spanish Fisherman protesting about something or other? Was there a ‘Y” in the day? “CONTROVERSIAL internet “spy cars” have been spotted in York, prompting an outcry from privacy campaigners. What level of privacy can you expect when you are in PUBLIC areas? I’m choosing zero. Don’t want to be seen in public? Don’t go out in public. @foo: I read that article, and many others like it, and I’m sure you’ll find that the people of York are either happy with Google Street view, or just don’t care. 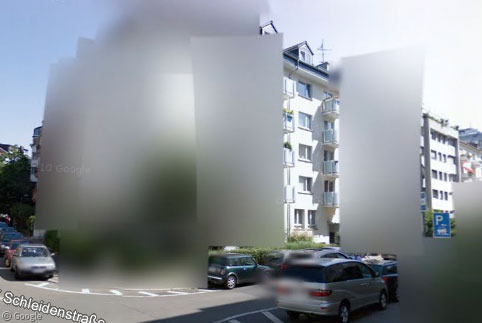 Simon Davies, the London based “privacy advocate” quoted in that article, has been in numerous articles shouting about how Street View invades privacy, but that’s really just one man’s opinion. The claimed “controversy” boils down to one factless article from the country’s crappest newspaper who, as we’ve recently seen, are very good at generating controversy out of nothing. If you follow the scooter rider for a while they not only switch from the finger to a thumbs up, they also give a “hang loose” and a #1 sign. That’s 3 to 1 in favor of the Street Views car from that person. Also, I see Google blurs license plates on cars, though the scooter license plate is not blurred at all, presumably because it is formatted differently and Google software doesn’t recognize it. @nova72 I think it’s much more likely that the McDonalds sticker is on the advert in the bus. Yes, if you take a step north on the bus view you can see more clearly that there is an advert in the front of the bus. Are you sure that the first “guy” is a guy, and not a girl? @Max – if you go back down the street a little you can see his head sticking out from behind a tree, and I think he’s definitely a he. Although I see exactly why you might think otherwise!